Deb's Cup of Tea: This Vexes Me. First One of 2013. I've been on a cleaning kick, a deep cleaning kick. I usually get this way when I have company coming. The girls look at me rather strangely because I'm moving things and dusting as well as scrubbing floors. Pilchard was not amused with my total cleaning of the area by the litter boxes. I cleaned and disinfected, which included the use of an odor remover that is applied to the floor and left to dry. Then you wash the floor as usual. That required two days of cleaning which meant the litter boxes were not in their usual places. She peed on the floor to express her displeasure with this arrangement. Sigh. Oh well. I was cleaning anyway. As I was washing the bathroom floor, I noticed the mop felt 'funny'. I turned it over and saw that the mop head has separated, partly, from the rest of the mop. This means I need another sponge. I always dread this. I don't mop as much as other people do. I really don't need to, so the mop doesn't get replaced often. I'm dreading going to the hardware store, where I got this (I have to go anyway, not just for this.) because every time I've gone to replace the sponge, I've had to buy a new mop because the sponge size I have isn't made anymore. 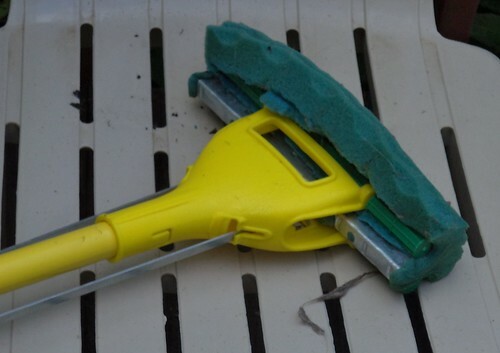 So I ask you, are sponge mops evolving so fast that we have to have a new design every year? It stands in a bucket in the basement 80% of the year. After use, I let it dry out completely so it's not like it sits in water so it rots. It just vexes me that I have to spend upwards of $15 to wash the floors. Well, wish me luck this weekend. Let's see what I can find. Then I can wash the kitchen floor and really get the cats worried.